Baked Sriracha and Soy Sauce Tofu has shown up on Garden of Vegan a lot, so I figured it was about time that I share the recipe! I rely on this recipe a lot because it’s quick, versatile, great for meal prepping, and there’s very little clean-up afterwards. I pretty much always have the ingredients on hand so it’s really convenient to make when I’m not in the mood for cooking. This recipe only uses 4 ingredients and requires less than 10 minutes of active cooking time. You don’t have to press the tofu for this recipe so you can just mix up the ingredients and throw it in the oven. Start cooking some quinoa, steam some veggies, and you’ll have a great vegan meal in 25-30 minutes! I often use this tofu in stir-fries, salads, and vegan lunch bowls, but it can be used in a lot of other ways too. I’ve eaten it in burritos, sandwiches, and all by itself for a high-protein snack. I don’t measure anything when I’m cooking this tofu at home but in order to turn this into a recipe I’ve included measurements for all of the ingredients. Feel free to play around with different ratios and ingredients, I suspect it would be delicious with a touch of sweetness too! This recipe is nut free, gluten free (ensure that you’re using gluten free soy sauce), low sugar, and no sugar added. Just 4 simple ingredients for delicious tofu! Supplies: Chef’s knife, mixing bowl, tongs, parchment paper, cookie sheet. 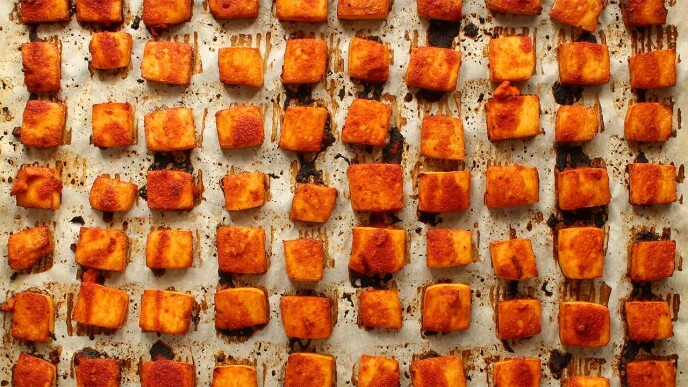 Slice your tofu into 1″ x 1″ squares. I’d recommend sticking close to that size and ensure that you slice it no thicker than 1/2″. Check out Part 2 of my Tofu Tutorial different ways to slice tofu. Add the tofu to your mixing bowl and add the olive oil, sriracha, and soy sauce. Gently mix to combine. Spread evenly on a cookie sheet lined with parchment paper and bake for 10 minutes. After 10 minutes, remove your baking sheet from the oven and flip each piece of tofu. Drizzle the remaining marinade over the tofu and bake for another 10-12 minutes. Drizzle the remaining marinade over the tofu for an extra kick of flavour! Once the tofu is crispy on the outside, remove from the oven. Crisp, delicious, and lightly spicy: Baked Sriracha & Soy Sauce Tofu. This tofu can be served hot or chilled, either way is delicious. This recipe is so versatile, there’s really no limit to the ways it can be used. This Baked Sriracha & Soy Sauce Tofu is flavourful and easy to prepare! This simple no-press tofu recipe uses just 4 ingredients. Baked Sriracha & Soy Sauce Tofu is great for sandwiches, wraps, salads, and vegan rice paper rolls. Slice your tofu into your desired shape. I usually go with quarter-sized squares - I'd recommend sticking close to that size and ensure that you slice it no thicker than 1/2 inch. Spread evenly on a cookie sheet and bake for 10 minutes. One the tofu is crispy on the outside, remove from the oven. This tofu can be served hot or chilled, it's delicious either way! This recipe is so versatile there's really no limit to the different ways it could be used. I usually eat it in vegan lunch bowls and hearty salads, but I've also used it in stir-fries, burritos, wraps, sandwiches, burgers, and as a simple side dish with steamed veggies and quinoa. It also makes an awesome savoury snack all by itself! I’ve only just recently gotten into the whole “vegan lunch bowl” thing but I am absolutely in love with them! They’re so visually appealing, healthy, and I can tailor them perfectly to my preferences. What exactly is a vegan lunch bowl? Usually a complementary combination of different vegan side dishes, grains, fresh and/or cooked vegetables, nuts & seeds, dips and/or sauces. Vegan lunch bowls are a fantastic way to use up leftovers or little bits of different ingredients you might have on hand. Baked Sriracha and Soy Sauce Tofu is absolutely ideal for vegan lunch bowls. There’s very little active cooking time and once you get the tofu in the oven you can continue prepping all of your other lunch bowl ingredients. Adding one serving of this tofu to a vegan lunch bowl is a great way to boost your protein intake (13 grams per serving) making it a perfect addition to post workout lunch bowls. For zucchini noodles: Use a regular peeler for wider ribbons or a julienne peeler for thinner strands (I use the Zyliss Julienne Peeler – affiliate link) and peel from the very top of the zucchini to the very bottom in one motion. Give it a quarter turn and repeat until you’ve peeled the entire zucchini into “noodles”. Preheat 1 tsp of coconut oil over med-high heat in a saucepan and sauté the noodles for 3-5 minutes or until tender and slightly translucent. For shredded carrot: Use the same methods described for peeling zucchini noodles or use a grater for smaller shreds. For a nice crunch you can add it to your vegan lunch bowl raw, or lightly sauté it along with the zucchini ribbons. To serve: In a wide, shallow bowl, arrange a scoop of hot quinoa, a serving of the baked tofu (hot), the zucchini noodles (also hot), and shredded carrot. Top with sliced avocado, a dollop of hummus, and a few grape tomatoes. Substitutions: The beautiful thing about vegan lunch bowls is that you can tailor them to your taste preferences and individual needs, so feel free to change the recipe to suit your tastes and preferences. Some more great ingredients: canned black beans or chickpeas, roasted chickpeas, cooked brown rice, baked sweet potato, roasted russet potatoes, whole grain couscous, hemp seeds, pumpkin seeds, chopped almonds or cashews, baby spinach, steamed kale, etc. There’s nothing quite like a nice and big hearty salad. Wimpy, sad little salads are a total injustice to healthy vegan eating – there’s no need for it! I love a good salad that’s colourful, full of texture, and covers every food group while also being delicious, healthy, and super filling. I tend to eat slightly different variations of this salad a lot. I’ve been eating this salad semi-regularly for 2+ years and I’m still not sick of it (not even close!!) This is definitely where I use my recipe for Baked Sriracha and Soy Sauce Tofu the most. This is a really fantastic salad to take on the go for a healthy, filling lunch or dinner. To make this salad portable: Combine the spinach, chilled Baked Sriracha & Soy Sauce Tofu, and pumpkin seeds in one container. Add the balsamic vinaigrette to the chopped tomatoes in a separate smaller container. Put a scoop of brown rice (optional) in a third container with half of a scored avocado in plastic wrap. To serve: Scoop out the avocado with a spoon and add all ingredients to the spinach and tofu, seal with a lid and shake until all ingredients are combined. Want to see more ways to use Baked Sriracha and Soy Sauce Tofu? Browse the “sriracha and soy sauce tofu” tag on Garden of Vegan. This is a great way to marinate tofu! Every recipe looks very tasty, I have to try every one of them. Wonderful! I hope you enjoy the recipes! Just made these and they are SO good. I love tofu cooked at restaurants but could never quite get the flavor right at home. This recipe is perfect! Yay! I’m glad you enjoyed it Kate! I love this recipe so much. It’s something I make all the time. However, I always run into the same problem: no matter how gently I mix my tofu it breaks and I get all these little tofu bits that I can’t really cook. What brand do you use? I’ve considered that may be part of it. That or perhaps the container I’m using is too small. I use Sunrise Soya Extra-Firm or Firm tofu. Their Soyganic “pressed” tofu is even better (for staying together.) Look for extra-firm or pressed tofu. My tip would be to marinate your tofu in a really shallow, wide container, like a 13×9 or 9x9x pan. You can just pour half the marinade into the bottom of the pan, place the tofu in a single layer, and pour the rest of the marinade on top. That way you can just flip the tofu once rather than stirring. That should help! Wow! After following your tumblr blog for an age I finally made this and it is AMAZING. The best tofu I have ever made. I’m trying to be prepared for this weeks lunches but I really just want to eat all the tofu. Thanks for the recipe! Yay, thanks Rosie! I’m so glad you like it 😀 Thanks for commenting, I appreciate it! Do you need to press the tofu before slicing it? I made this tofu last night for my first attempt at Summer Rolls and it’s AMAZING! I think one of my favorite baked tofu recipes I’ve tried. It’s hard not to eat it all while wrestling with the rice papers… my boyfriend kept eating them also!! Thank you! I’ve made this recipe multiple times now. My husband eats it right off the pan lol. Thanks! Oh that’s great! So glad you guys like it 🙂 Thanks for commenting! This recipe sounds delicious! I’m hoping to make the tofu later this week – first as part of dinner and use of leftovers with your spring roll recipe the next day. I was wondering how you typically store the leftover tofu? Can I just put it in a airtight container and refrigerate? How long will it keep safely? Hi Becca, that sounds great! I usually just store the tofu in an airtight container or ziploc bag. It should be good for at least 5 days but we usually eat it looong before then. I had never even tried tofu before making this recipe. It is very good! I am putting it in fried rice. Thanks for the recipe! I just found your site, looking for ways to transition to veganism. You have such great information! Can’t wait to try your recipes! Wondering what you use for balsamic vinaigrette? Right now I have Kraft at home but want to try and make my own. Our site will definitely help with the transition. Thanks! Hi Julie! Unfortunately I think I was a using a bottled vinaigrette as well and it’s no longer available 🙁 This recipe is highly rated and you could sub out the honey for brown sugar or maple syrup. I hope that helps! This recipe looks great. How big is your block of tofu? I have a 900gram block but I’m assuming yours is smaller as i don’t think that marinade would go far with this much tofu. Could this be made without the oil? I think so! I don’t see why not, but the cooking time might need to be extended! Ah, it sounds like your oven temperature is too low. You should be able to just cook it a little longer or increase your oven temperature. Did you include the oil in the recipe? Only the edges should really be crispy. For even crispier tofu, slice the tofu a little thinner next time. I love this recipe and have made it several times. It’s got a great kick to it! I’ve got some friends who aren’t as good with spice so for a milder version I use only 1/2 tbsp Sriracha and 1 tbsp Honey with the oil and soy sauce. Thanks for commenting Julie! We really appreciate it! Yummy!!! We loved it! So much flavor. I did make sure I cooked it long enough to cook away the moisture. Do you freeze your tofu before cooking with it? I’ve heard it soaks up the marinade better. I don’t and it’s not necessary for this recipe but you’re right, freezing tofu does help it absorb more marinade. I think with this particular recipes (with the basting…) it might end up soaking up too much marinade and being to flavourful. Pressing or freezing your tofu is totally unnecessary in this particular recipe. Thanks for commenting!! Wow, this looks really good! Is this very spicy? I don’t think so! if you want to cut down on the heat, cut your tofu larger or reduce the sriracha a bit! I made this to put on top of salads, and the flavor is nice. Presentation…. not so much. The tofu crumbled badly as soon as I tried putting it in the bowl with the marinade. I pressed my tofu only a bit at first, but I highly recommend a more serious dehydration before placing the tofu in the marinade. Thanks for commenting Anya! That’s really strange, I haven’t had that happened before. What kind of tofu did you use? I make this recipe all the time! This is some of the best tofu I’ve ever tasted thank you for posting it!